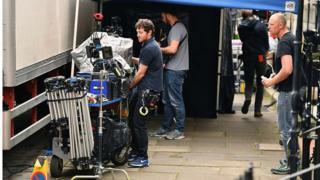 Image caption A stronger UK film industry helped the service sector to expand, the ONS said. UK economic growth edged slightly higher in the three months to June, as a stronger service sector offset weaker manufacturing and construction. The Office for National Statistics (ONS) said the economy expanded by 0.3% in the quarter, up from 0.2% in the previous three months. But the ONS added there had been a "notable slowdown" from last year. "While services such as retail, and film production and distribution showed some improvement in the second quarter, a weaker performance from construction and manufacturing pulled down overall growth," said Darren Morgan, ONS head of national accounts. Although the economy eked out higher growth in the second quarter, it was below levels seen in the final three months of 2016, when gross domestic product grew by 0.7%. Analysts said the latest ONS data, which is an initial estimate, diminished the chances of an interest rate rise any time soon. Chris Williamson, chief business economist at IHS Markit, said: "The confirmation of the lacklustre performance of the economy so far this year surely also diminishes the chance of an interest rate hike any time soon, especially as growth prospects for coming months have become increasingly skewed to the downside." Film production in the UK, plus box-office receipts from cinemas, was one of the best performing parts of the economy during the April-June period. The ONS said ticket receipts from Wonder Woman and the latest Pirates of the Caribbean film were among the items that had boosted the sector it calls motion picture activities. That sector grew 8% in the second quarter. Chancellor Philip Hammond said the UK economy had now grown consistently for four-and-a-half years. "We can be proud of that, but we are not complacent," he added. "We need to focus on restoring productivity growth to deliver higher wages and living standards for people across the country." Labour shadow chancellor John McDonnell said: "Growth for the first half of 2017 is below expectations, and it follows continued data showing working families are being squeezed with wages not keeping up with prices." Aberdeen Asset Management chief economist Lucy O'Carroll said: "This pick-up will be taken as good news, but it really doesn't amount to much. "The figures are the first estimate of growth, based on very patchy data. They always get revised over time, and often substantially so. "It's the underlying trends that matter. They don't look favourable at the moment, given the uncertainties around Brexit and the pressure on household budgets from higher inflation." That was backed up by Andrew Sweeney, from Care Building Services. He told the BBC: "We seem to be pricing a lot more projects. We price projects for clients; we have estimators in the office. After we've priced it the clients pull it because it is coming over the budget. "We've been given orders for jobs and at the last minute the clients have pulled them away from us due to concerns over the market." Kallum Pickering, senior UK economist at Berenberg, said the UK's growth in the first half of the year had been its slowest since 2013. He added: "Whereas growth has accelerated significantly so far this year in continental Europe and many emerging markets, the UK is missing out. "While the downside risks from the Brexit vote have not yet played out in a major way, the uncertainty stemming from Brexit is leading to caution in all areas of spending and policy that have long-term implications. "The UK would probably be growing at 2.5% or above this year were it not for Brexit, with strong gains in real wages and more business investment." On Monday, the International Monetary Fund downgraded its forecast for UK economic growth this year because of the weak first-quarter figure. The IMF said it expects UK GDP to grow by 1.7% instead of its previous projection of 2%.